If you happen to read MBA on a regular basis, you may remember me discussing my fear of yeast and my attempt to conquer that fear with the help of Amber from Bluebonnets and Brownies. Well since that post a couple of months back, I have been a bread baking fool and no longer doubt myself in the yeast department. In fact, I probably have more bread baking supplies and tools than some bakeries and with that came a serious addiction to the King Arthur Flour website. Since I’m no longer a yeast novice, you can imagine how excited I am to flaunt my newly developed skills for this week’s Holiday Recipe Exchange sponsored by Red Star Yeast. As soon as we gained Red Star Yeast as a sponsor, I knew exactly what I was going to make – Pumpkin Cinnamon Rolls. 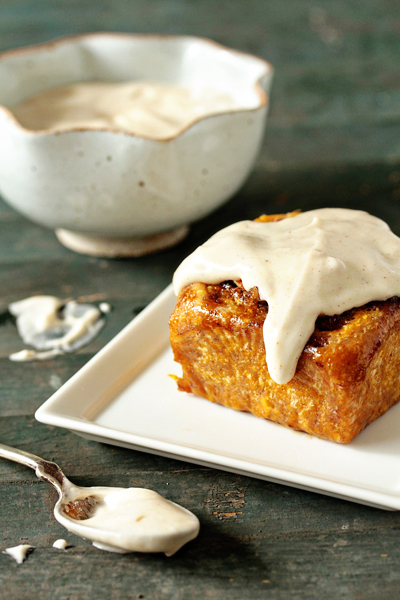 These three words alone are enough to get any pumpkin lover jonesing – smother the Pumpkin Cinnamon Rolls with a Maple Cream Cheese Frosting and you’ll pretty much be in sugar-coma heaven. 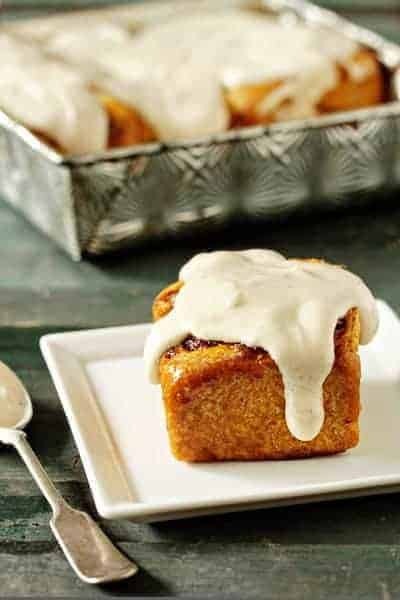 The pumpkin puree in the roll base creates a slightly denser dough, so these definitely are not as pillowy as a traditional Cinnamon Rolls – but they are just as delicious. I generously spiced these gorgeous rolls with homemade pumpkin pie spice and tossed in chopped pecans for a pleasant textural crunch. As with most yeast based recipes, these Pumpkin Cinnamon Rolls definitely take a little time and effort, but I promise you the results will be well worth it. Remember – the longer you let yeast develop in a recipe, the more flavor it will have. Red Star Yeast pride themselves on providing the freshest, best yeast around, so let the little yeasties do their job and add tremendous flavor to your baked good. Once you’ve done it once, I swear you’ll never look back. Be sure to check out Red Star Yeast on Facebook and Twitter for delicious recipes, great information on yeast and much more! Now , we want you to share your favorite recipe using yeast and be sure to head over to Good Life Eats, because Katie has a wonderful recipe for Sweet Potato Rolls waiting for you! 9. To make the glaze: In a medium bowl with an electric mixer, combine the cream cheese, butter, maple syrup, confectioners' sugar and pumpkin pie spice. Mix on low speed until thoroughly combined and creamy. Feel free to adjust the frosting to meet your needs. If you like a thinner frosting, add in a little milk (start with 1 teaspoon) and slowly increase until you reach the desired consistency. If you want it to be thicker, add in a little more confectioners' sugar. *Adjust the amount of water by the time of year or your climate. For summer, or in a humid environment, use the lesser amount of water. In winter, or in a dry climate, use the greater amount. It's always best to start with the lesser amount; you can always add more. (I needed the full 1/4 cup in my rolls). 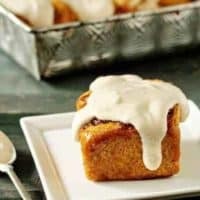 The pumpkin puree in these Pumpkin Cinnamon Rolls make them a bit more dense when compared to a traditional cinnamon roll. According to King Arthur Flour, you can substitute the White Whole Wheat Flour for All-Purpose, you will just need to decrease the amount of water needed by about 2 teaspoons. If you are unsure what the dough should look like, definitely check out this post on KAF for an in-depth photo tutorial. If you prefer more maple flavor in your frosting, just play around with the proportions until it meets your needs. The frosting pictured above is a bit on the thick side because I made it the night before and refrigerated it until the next day. Ideally, it should be a bit thinner. Write and post a recipe on your blog featuring YEAST. Include “Come join the fun at the My Baking Addiction and GoodLife Eats Holiday Recipe Swap sponsored by Red Star Yeast.” in your blog post. Submit your post before November 7th, 11:59 PM.